Prashant Bhaskar is a Senior Lecturer in Maritime and Logistics Management at the National Centre for Ports and Shipping at the Australian Maritime College. Prashant has worked in the maritime industry for 35 years, both as a seafarer and educator. Prior to joining the Australian Maritime College in 1993, Prashant worked for a number of overseas shipping companies as a deck officer on a range of ships including bulk carriers, tankers, container ships and multi-purpose general cargo carriers. 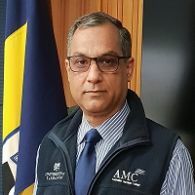 Since joining the Australian Maritime College as an academic, Prashant has held senior positions including Head of Centre for Vessel Operations, Head of School of Maritime Industry Operations, Associate Dean Learning and Teaching, Australian Maritime College, and course coordinator of a number of VET and undergraduate courses. MBA (MarMgt) (2006) Australian Maritime College, Australia. Prashant has over two decades of teaching experience, both in the VET and the Higher-education sectors. Current teaching responsibilities include JNB160 Exporting and Importing and JNB155 Ship Operations Management. Both Units are core subjects in a number of undergraduate courses offered by the Department of Maritime and Logistics Management. Prashant's research theme aligns to University's research theme of Marine, Antarctic and Maritime. Prashant's research interests include the resilience and sustainability of shipping companies. This research project will:Determine current and future employability skills and dimensions required for professional practice;Investigate similarities and differences in skill sets inherent in CLOs between international universities providing maritime business degrees;Develop a tool to evaluate alignment between industry employability skill sets and CLOs of maritime business degrees; andRecommend strategies to align the curriculum of maritime business degrees with employer-identified future skill sets.